COMES WITH LIFETIME GORILLA STANDS WARRANTY! Weight capacity: 50kg. 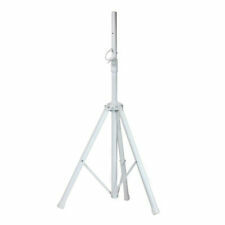 The speaker stand is an ultra-sturdy fold-out tripod speaker stand that perfectly fits any event. The sturdy and expandable long tripod legs ensure that your speakers will be stable in any occasions. 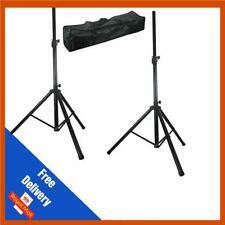 Gorilla Stands GSS-300 Heavy Duty Professional Tripod Speaker Stand PA DJ SINGLE. This is a used tripod, loud speaker/PA stand with bracket. It is in excellent condition as it has barely been used. Strong Locking suitablble for DJ Disco. Adjustable Height. NJS 35mm Adjustable Aluminium PA Speaker Stand. A high quality black speaker stand made from aluminium with a 35 mm centre pole capable of a 40 kg maximum load. Features a large heavy duty adjusting knob and a sturdy lock Pin with multiple holes. The item has been fully tested and works perfectly. Can I reserve item(s) that I intend to buy later?. Active PA Speakers. How do I find the item number or product code?. What if I have not received my order?. SSL stand is quick and simple to put up and all the fixtures and integrated into the stand. This SSL Stand is a heavy-duty steel tripod speaker stand. Quick and simple to setup. Load Capacity: 50kg. For sale is my pairof PA speakers stands. Each speaker standis fully height adjustable from 100-160cm so can be tailored to the venue.These stands are heavy-duty and have a maximum load of 45KG making the suitablefor most passive and active speakers. A pair of modern, black speaker stands with adjustable height settings that are easy to set-up and fully portable. A fitted safety pin will help ensure maximum strength and security of your mounted speakers. These stands are NOT designed for large heavy speakers, these are recommended for 8 to 10 inch speakers only. Main Features Height Adjustable Safety Pin for Security Maximum Load 20kg Perfect for 8 and 10 Inch Speakers. Proel Tripod set of two speaker stand. Stand features include heavy duty locking knobs and pin position safety lock. White powder coat finish. Max Height: 1800 mm. Max load: 30kg. Protective bag supplied. Can I reserve item(s) that I intend to buy later?. How do I find the item number or product code?. Need more information?. What if I have not received my order?. When will I receive confirmation of my order?. Ibiza Sound LED Illuminated Speaker Stand. Demo, Fade & Flash modes. Tube diam. Adjustable height 1.80m max. These stands are heavy-duty and have a maximum load of 50KG making the suitable for most passive and active speakers. Includes 2 x Tripod Stands And 1 x Carry Case. Pair Of Speaker Stands With Bag. Includes: 2 x stands, 1 x bag. 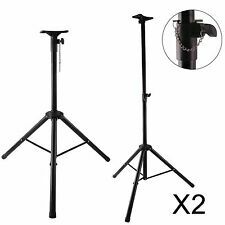 2x Folding tripod PA disco l oud speaker stands. Double Sided Scrim Cover Design. Pyle was founded in the 1960s as a leading manufacturer of high-quality advanced woofers. Universal Compatibility to Fit Virtually All Tripod Stands. Festoon Bulbs. Provides A Clean Look to Your DJ Presentation Setup. 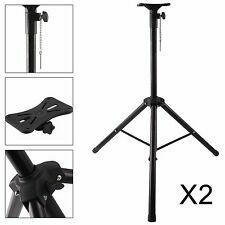 2x QTX Height Adjustable Steel Tripod PA Speaker Stand Kit inc Carry Bag. A high quality speaker stand made from aluminium and featuring a 35mm centre pole. An excellent speaker stand, light and easy to adjust to the right height you want your speakers. Make your setup look professional with this robust metal stand. You can adjust the height from 1m to 1.8m: a very flexible range to suit the occasion and location. Use for PA equipment, at parties and this would be highly credible for mobile transport or bands and musicians on the go..
Comes With 5 Year Warranty! Two universal Accu tripod, speaker stands in a carry bag. 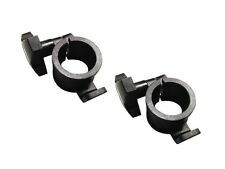 • Includes socket mounting bracket to attach to speaker. • Heavy Duty Speaker Stands. • 1x Carry Bag. • Weight capacity: 80 lbs. 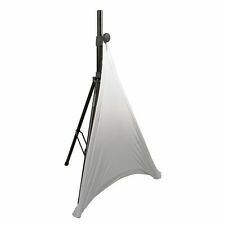 Beamz Parbar Light Tripod Stand 2.3m Max. Tripod Light stand with adjustable height. 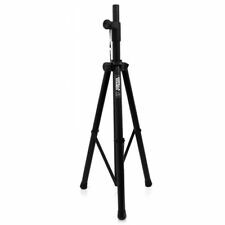 Stable tripod light stand with adjustable height from 1.45 to 2.3 m. The stable tripod design can withstand loads of up to 25 Kg and can be quickly assembled and dismantled. Can I reserve item(s) that I intend to buy later?. Height: 1.8m. Height: 180cm. Active PA Speakers. Need more information?. What if I have not received my order?. How do I find the item number or product code?. Stable tripod base & scratch resistant powder coating. Q series speaker stand set. When we have received the item back it will be checked to confirm the fault. Folds flat for easy transport. Maximum load: 60kg (132lbs). An NJS high quality, black speaker stand made from aluminium with a 35 mm centre pole capable of a 40 kg maximum load. Features a large heavy duty adjusting knob and a sturdy lock Pin with multiple holes. 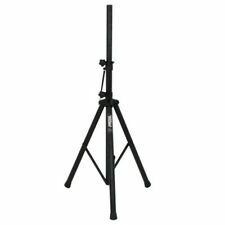 Gravity SP 4722 B Heavy Duty Steel Wind Up 35mm Tripod PA Speaker Stand. Chase Speaker Stand CSS-80. IT'S CHEAPER AT CHASE. It's Cheaper at Chase. A light weight speaker stand that features a pin locking system and capable of holding a weight of up to 25kg. Height adjustable from 116cm to 172cm. 5 STAR Customer Care! Main UK Dealer & Fast Delivery! 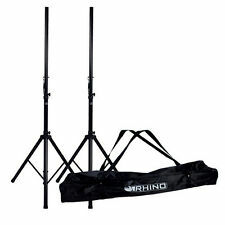 2X ADJ - LED Speaker Tripod Stands. Complete your set with these new ADJ Stands. Authorised ADJ Dealers. • 22 Dynamic Modes. • Load Capacity 66lbs/ 27kg. • Includes RF remote. • Speed Adjustable. • Direct Color Select. Also included is a large carry case for easy transporting & storage. Each speaker stand is height adjustable from 1100 - 1700mm so ideal for most venues. load of 45kgs. Pair of 35mm White Speaker Stands. Tripod Bag for 1 or 1-2 speaker or microphone tripods, water-resistant, tear-resistant material, sturdy zipper, reinforced carrying strap. 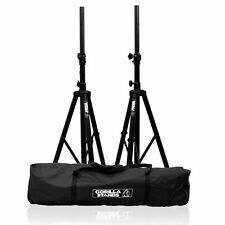 The Pronomic tripod bag is made of water-repellent, tear resistant material and provides optimal protection for one to two microphone stands or a speaker stand. 2x Ibiza Sound LED Illuminated Speaker Stand Tripod. This bundle includes Colour: Black. Demo, Fade & Flash modes. Top and bottom plate: 5 mm foam. Fastener: 1 zipper.